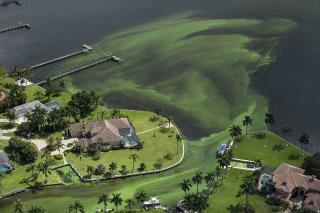 (Newser) – Beaches are closed in South Florida, where a massive algae bloom has caused water to turn bright green and Gov. Rick Scott to declare a state of emergency in four counties—Martin, St. Lucie, Lee, and Palm Beach—over Wednesday and Thursday, reports Weather.com. Health officials are telling people to stay out of the water if they notice discoloration and not to use tainted water to water their lawns. And tainted it is, according to one resident who tells CBS Miami, "The only way to describe how it smells is like a hundred dead animals that have been sitting in the street for weeks." What some blame for the toxic turmoil: a water release from Lake Okeechobee, found last month to have more than 20 times the level of toxins deemed safe by the WHO, per TCPalm.com. People on the east coast of Florida BEGGED that idiot Scott not to approve this release because they predicted that this would happen. Scott basically to them FU and that he didn't care about them because it is an area of Florida that trend Democratic. The water should have been released to the Everglades where it would have been naturally filtered and actually mimic the natural flow patterns. But Corrupt Idiot Scott wouldn't approved that because his gun nuts supporters didn't want to get their feet wet. All true. Get ready for the new normal. Look forward to disease vectors changing for the worst, destructive bugs who can live through a winter that is just a few degrees warmer devastating forests,big stinky and sometimes toxic algae blooms, etc. etc. etc. Tip of the "ice berg" folks. And no, your goat herders book won't save you. You break it, you bought it.